I seem to go through seasons where I feel the need to get organized NOW. Typically, it’s the start of a new year, and the start of school in September, and then there’s the start of summer. I don’t know why summer brings about my need to organize, but it does. Maybe it’s all the outside time we get – then I come inside and always feel like things are in disarray. Regardless of why, I am in one of those seasons now, so I thought I would share a few simple tips with you that you can use to get organized TODAY. I am going to assume this is a problem for most people…and if you are one of the lucky few who don’t struggle with clutter, feel free to move on. For the rest of us, getting a hold on clutter is very important. I know my family struggles with this more than anything else. Our home can be CLEAN, but there are piles of things in every room. Paperwork gets piled on the counters, clothes pile up in bedrooms, wires piles up in corners, dishes in the sink…you understand. If you do nothing else, pick ten minutes a day to clear off a pile of clutter. Pick the room where you spend the most time in, and start there. If you do this daily, I promise it will make a huge difference. Some people like to start with the easiest or quickest tasks on their list and work that way. Through years of trial and error, I have learned it is best for me to start with my biggest task – the one that will make or break my day. The thing that will make the most difference in your day. This will usually be the thing I want to do LEAST, but I know that is tends to be the most important. If this is done early in the day, I feel I can breathe easier, knowing I don’t have to dread it throughout the day. These days, we all have numerous calendars…iphones, tablets, computers, planners, desk calendars and the list goes on. When was the last time you took a few minutes to make sure all your calendars lined up with each other? I know I have a calendar on my phone, a physical planner, a business planner and a home calendar. Things can get quite chaotic when I forget to sync them all, and then make sure my husband’s calendar lines up too. I know I have missed doctor appointments and play dates because I forgot to write the dates down in the proper calendar. So now, I try to take time a few minutes each week to make sure ALL the calendars for our household are synchronized for the upcoming week. I feel so much more organized when I know I can look in my planner and not feel I am missing something important. 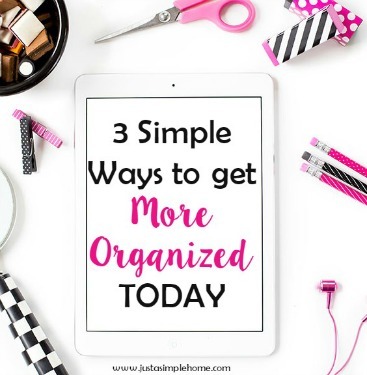 What other simple tricks do you have to staying organized?